A stunning two bedroom luxury apartment is currently being offered for short breaks and holiday rentals in the North Yorkshire coastal town of Whitby. Perfectly situated right beside the River Esk, and offering wonderful views over the river and Whitby Abbey, this fine apartment could be just what you are seeking for your accommodation in Whitby. A modern and spacious apartment fully equipped for your stay, the Moorings will not disappoint, it offers parking space, fishing rights and private mooring, and is handy for the centre of Whitby and for touring the beautiful North Yorks Moors, one of the most popular toruist attractions in the region. When the weather is pleasant there can be no better way to spend a few hours strolling along the pretty River Esk, or simply while away an hour or two in the harbour of Whitby. 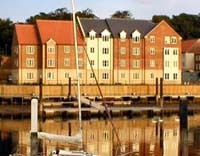 This luxurious Whitby holiday apartment is offered for short breaks from £215 and weekly holidays from £325.